All you have to do is stand on the short summit of Acadia Mountain and peer down at the lobster boats anchored in Southwest Harbor to understand why so many families are drawn to Maine’s Acadia National Park. Out West, the towering cliffs of Zion and the domes of Yosemite perfectly illustrate the grandeur of America’s National Parks. Acadia is pint-sized in comparison and thus much more manageable, especially for kids. Short hour-long climbs like the one up Acadia are within easy reach, only serving to intensify the bond between nature and nature lover. Here, everything is on a human scale. It’s hard not to be dazzled by the variety of scenery at Acadia. The only mountains on the East Coast, vast pockets of forest, the Atlantic Ocean, even a landlocked fjord all add to the allure. 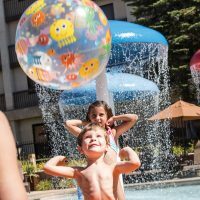 You’ll want to spend as much time as the kids can muster outdoors. Rent bikes and try the 43-mile network of carriage path trails, narrow hard-packed gravel paths that line the entire eastern half of Mount Desert Island. Or grab a canoe and paddle the largest body of water in the park, Long Pond. Of course, all around you are a vast network of hiking trails from the ones that skirt Jordan Pond to the Ocean Path that lines the rugged shoreline of the mid-Maine coast. After climbing mountains and biking in the woods all day, it’s nice to pamper yourselves in civilization during the late afternoon and night. 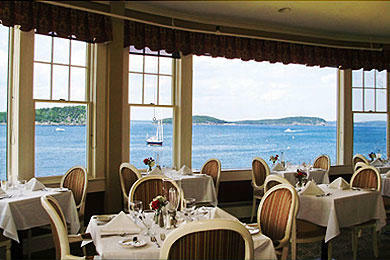 The Bar Harbor Inn does its best to make guests feel like lords of the manor. Don’t miss the freshly baked cookies in the main lobby in the afternoon. Then retreat to your room and that heavenly deck to watch all the boats going in and out of the harbor. In front of you is the Shore Path, a walking trail that’s wonderful any time of day, with large Bald Porcupine Island looming in the background. Arguably, the best part of the Bar Harbor Inn is that you’re in easy walking distance of all the restaurants and shops that line Bar Harbor. 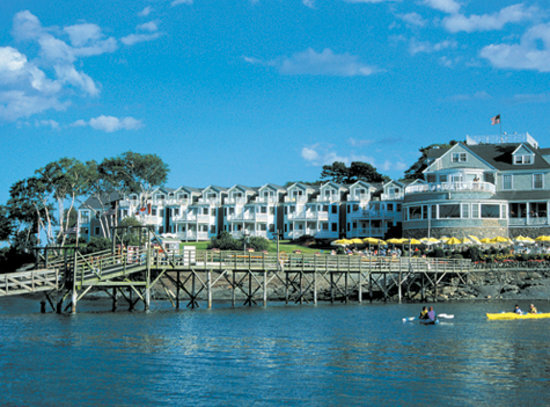 The resort is split into 50 rooms in the Main Inn, an additional 64 rooms in the Oceanfront Lodge, and 38 guest rooms in the Newport Building. We hit the jackpot with room 312 in the Oceanfront Lodge. Sure, the two queen beds, refrigerator, shower with large head, and flat-screen television were all perfectly suitable. But then you open up that screen door and there's a balcony with glorious views of the seaweed-laden rocky shoreline and lobstermen picking up their traps as they motor by. At night, we kept the screen door open to get the salty air and sounds of the waves rushing ashore. Spend the extra money and make sure your room has a balcony or patio with an ocean view! Continental breakfast is included in the price of the room and features blueberry yogurt, muffins, granola, cereal, English muffins, hard-boiled eggs, fresh fruit, coffee and juice. We also took full advantage of the fresh-baked oatmeal raisin and gingersnap cookies, served with coffee and hot chocolate every afternoon in the lobby of the Main Inn. The only irritation was paying for the use of WiFi in the room. This should be a free service. We visit Maine a lot, but this is our 1st stay here. I am pretty sure it will not be our last. The room felt luxurious, the bed was very comfortable, the continental breakfast was a lovely way to start the day. But, by far, the best feature was our private ocean view deck. I didn't have to leave the room for my sunrise photos. It was glorious. Granted, I was only up for sunrise two of those days, but even with the Sun higher in the sky it is still an absolutely amazing view, as was sunset. Saw several types of birds in the water and the view is unincumbered by streets or traffic. Just the occasional walker on the shore path. My one bummer was that the spa and hot tub that were part of the advertisements were not actually available due to ongoing remodeling. I got a new swimsuit with a hot tub in mind and would have had to go down the road to another property to actually use it. That seemed overly awkward so I did not. The super convenient location is a huge mark in BHI's favor for future stays as well. 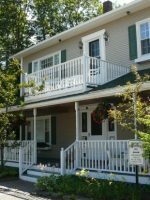 Easy walking distance to anywhere in town and close to the Park entrances. Acadia is the actual reason we come, after all. There are many options for staying at this inn. There are rooms at the main hotel and then few out buildings each with 2 floors of rooms. Those rooms on the water have amazing views, even though interfered by the occasional cruise ship. Continental breakfast is included with your stay. Decent to start the day. The fruit was only "ok". They had an assortment of "homemade" muffins, bagels breads, yogurt, cereal , etc. They also had hard-boiled eggs. You could get coffee to go, in very tiny cups. Can't speak for the spa, but the gym was tiny with just a handful of machines and a few weights. It is a very easy and quick walk to the heart of the town. Rooms were nice but nothing over the top and did come with a mini fridge. The main hotel was classic and the restaurant was nice and up-scale. The main lounge was ok. It had a piano player at night. Was surprise at them not having drought beer. If you want to be near the water, this is the place to be. This is not the type of hotel where you're going to spend the bulk of your day on the property. If you're like us, you'll wake up to the continental breakfast and then off you'll go exploring Acadia. The kids liked the small heated outdoor pool when we returned from our outings outdoors while my wife and I would often take the mile-long Shore Path along the rugged coast. Your first stop at Acadia is the Visitor Center on Route 3 to pay for a car pass and talk to a ranger about the realistic expectations for your children. You're not going to be climbing up the highest peak, 1,530-foot Cadillac Mountain, with a toddler. They'll point you in the right direction and more than likely recommend some of our favorite trails like Ocean Path, which leaves from the parking lot at Sand Beach and heads south to Thunder Hole, a good name for the waves that slam into this rocky inlet. Grab lunch and hike up 681-foot Acadia Mountain, on the western side of Somes Sounds, for some of the best vistas you've ever had with a meal. If you grab lunch at the Jordan Pond Gatehouse (which I strongly suggest), take a stroll on the Jordan Pond Nature Trail to see the turtles sunning on the logs. Be forewarned that as kids get older, they'll want to scramble up vertiginous rock walls on iron rungs like The Precipice and Beehive while mom and dad look on apprehensively. Grab a copy of the "Motorist Guide to Park Loop Road" at the Acadia National Park Visitor Center before you take the route. It offers historical insight and suggested hikes along the Park Loop. Exchanging two legs for two wheels, rent bikes at Bar Harbor's Acadia Bike and head to the shores of Eagle Lake, where a relatively level carriage path trail circles this large body of water under towering firs and over century-old stone bridges. At the southern part of the lake, Cadillac Mountain comes into view, and soon the kids are racing each other as they zip downhill. 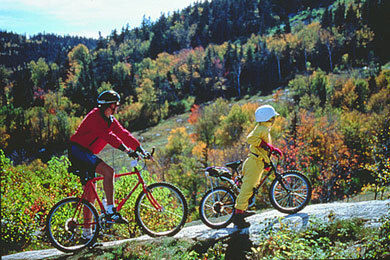 The owners of Acadia Bike also run a guided sea kayaking service called Coastal Kayaking Tours. On half-day jaunts in the Atlantic, we've taken double kayaks and gone eyeball-to-eyeball with harbor seals, while searching for sea glass on deserted Frenchman Bay islands. If this seems too strenuous, bring a picnic lunch and go canoeing on Long Pond on the western half of the island. When the kids grow tired of all the outdoor activity, I take them on a boat ride with Diver Ed, a naturalist who goes scuba diving with a camera attached to his head, only to return to the boat with such goodies as sea cucumbers, starfish, crab and lobster. He's hilarious and the kids and their parents love him, especially when he blows up his dry suit and looks like the Michelin Man. He also goes down with tiny GI Joe-like "Mini Ed," which lobsters down on the ocean floor love to attack. When he returns to the surface, kids get to touch of all his booty, including that mean 'ol lobster. It might sound campy, but we also enjoyed the nightly 7 p.m. Great Maine Lumberjack Show in nearby Trenton. "Timber Tina," who's been involved in logging sports since she was 7, runs an entertaining 90-minute program where her crew of four compete in such original fare as axe throwing, speed climbing up a tall tree, and underhand chopping. The kids also get the chance to work the big cross-cut saw, with a little help from the crew. The hotel is home to two restaurants, the glamorous Reading Room, a former Men's Club in the Main Inn, and the more family-friendly Terrace Grill, an outdoor restaurant overlooking the schooners and anchored sailboats in the harbor. We dined on lobster rolls as the sun was setting and finished up with blueberry pie, the quintessential Maine meal. A must-do at Acadia National Park is lunch at the Jordon Pond Gatehouse. Sit outside at green picnic tables overlooking the waters of Jordan Pond and a ring of craggy peaks and you quickly realize why Acadia is our only National Park in the northeast. The view is amazing. The kids loved the strawberry lemonades and the piping hot popovers, fresh out of the oven. Mom and dad like the seafood chowder and the cranberry salad topped with curried chicken. Save room for more popovers for dessert, this time topped with hot chocolate sauce and a scoop of mocha ice cream. The best way to taste the fruit of the lobsterman's labor is at the seafood-in-the-rough Beal's in the small fishing village of Southwest Harbor (182 Clark Point Rd., 207-244-3202). Grab a picnic table overlooking the lobstermen and dig into the red crustacean, lobster rolls, and clam chowder. Toddler-friendly fare includes grilled cheese sandwiches and French fries. 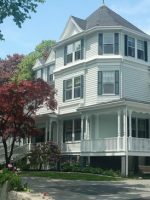 Here (33 Kennebec Place; 207-288-3828), dinner and a movie occur at the same time. All you have to do is order a pizza when you enter and lights flicker on the side of the movie screen to indicate when the pie is ready to be picked up. With an eclectic mix of overstuffed couches and chairs, every table at this restaurant (14 Mount Desert St., 207-288-4483) is different, but the food coming out of the kitchen is consistently good. Entrees include such fare as Portuguese mussels in a tomato saffron sauce with chorizo sausage and coconut-crusted tofu over basmati rice with swiss chard and broccoli. A short walk away, dessert is always homemade ice cream (including lobster-flavored) at Ben & Bill's (66 Main Street; 207-288-3281). It's nice to find an upscale hotel that still offers continental breakfast. Families know how hard it is to dine out every meal. But this hotel is all about location. 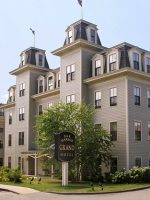 Set right on the water within walking distance to all the restaurants and shops in Bar Harbor, it's the ideal lodging to base your travels into Acadia National Park. The Park Loop around Acadia can be congested in the summer months, so it's preferable to come here in June or September to avoid the crowds. Even in late August, the region starts to thin out and the nasty mosquitoes and black flies are long gone. The hotel opens in mid-March and closes after Thanksgiving, so if you really want to take advantage of those savings, go in the off-season. But be forewarned that Bar Harbor is in northern Maine, where it can be chilly even on summer nights. 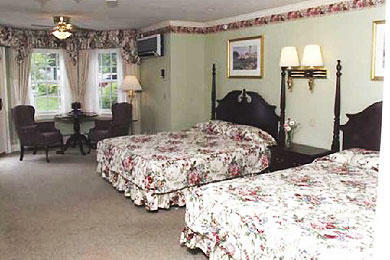 The nearest airport is Bangor's International Airport, which is just over an hour drive from Bar Harbor. US Airways flies into Bar Harbor's Hancock County Airport, located just 12 miles from the Inn, if you'd like to fly as direct as possible. If looking for better flight deals, Bar Harbor and Acadia National Park is a five-hour drive north of Boston. The fastest way to go is on I-95 North (go straight through Portland on I-295 North, which reconnects with I-95 North to save time), to I-395 East to Route 1A. Stay on Route 1A for a little over 20 miles and it will soon become Route 3, which will lead you onto Mount Desert Island. 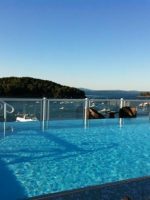 The Bar Harbor Inn offers babysitting, so slip away from the little ones and indulge in a spa treatment like a hot stone or deep-tissue massage. Mud wraps, facials, manicures and pedicures for both sexes are also available. 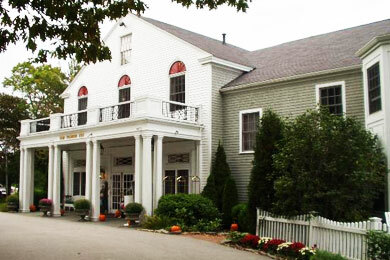 For one of the finest dinners in town, try the Rose Garden Restaurant in the Bluenose Inn. Salmon, steak and, of course, lobster, are all cooked with innovative flair.